This recipe will save any dish that goes wrong in your kitchen. 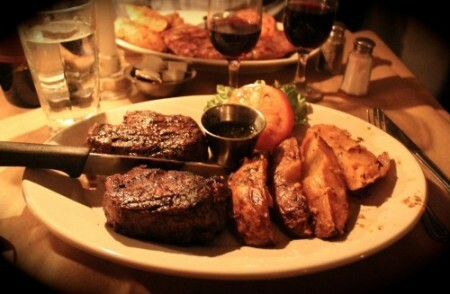 I’m talkin’ about a flavor-packed meal in the blink of an eye. With this sauce you can transform just about anything. Trust me, people will be asking for seconds. 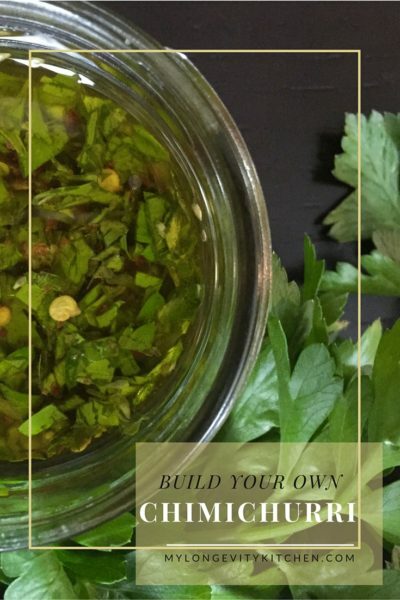 I’ve been making chimichurri for many years now. 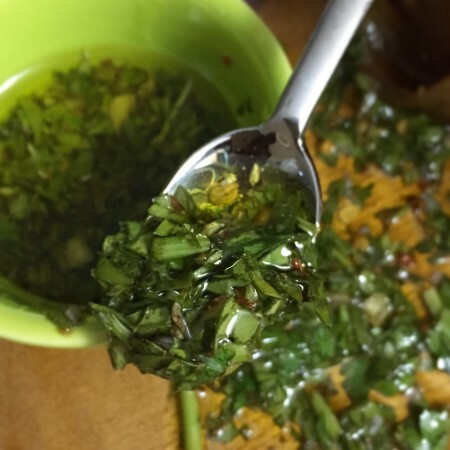 My husband fell in love with chimichurri long before he met me because he spent some time in Brazil. Together, years later, we dined at a famous Argentinian steak house in Chicago, called Tango Sur (white tablecloth, Argentinian staff, no reservations, and BYOB!). Tango Sur serves up steaks the size of the dinner plate, and along-side is a bowl of this glorious tangy garlicky sauce: Chimichurri. Thank you Argentina, for bringing this to the American table. Basically, Chimichurri is like a vinegary pesto, without the cheese or nuts. It is herbs, fresh and dried, with garlic, vinegar, plenty of oil, water, sometimes lime, and peppers, onions, and spices. Almost ANYTHING. This stuff is like money in the bank. It will last in your fridge for weeks, and kick all your dishes up about ten notches. Try it with any seafood, any meat, and as a dip or salad dressing. Saute shrimp and greens in this sauce, or just pour it over the finished product. One of my favorite things to do with chimichurri is a quick tomato salad – especially when I am serving something with chimichurri already – putting it in the salad dressing just ties the whole meal together. And it’s so fast and easy! I made this recipe BUILD-YOUR-OWN because you can truly customize it to your liking. I love making chimichurri with Cilantro…but honestly? That’s not really chimichurri. The authentic version would not use cilantro. BUT WE LOVE IT! It’s fun to combine cilantro and parsley in different quantities. And it’s great to be able to swap out ingredients according to what you already have on hand! The best part is there are two ways to actually make this. You can do it by hand, chopping everything real fine, just like they would in an Argentinian kitchen; or you can use a food processor like we do in the modern world because we like everything to be FAST AND EASY! Am I wrong? I would like to take a moment to send a shout out to the Italian man who started The Slow Movement, in 1986. From the farming of the food, to the preparation in our homes, to the time we finish eating; food should be cherished. Time should nearly stand still. Food is a wonderful thing, especially when it’s made with your own two hands. Go on and rock this recipe out whichever way you’d like. Don’t be afraid to try new things, ask questions, and taste as you go! And look at my notes at the bottom of the recipe for some great ideas for serving and storing this sauce! Tag @mylongevitykitchen on Instagram or Facebook, or #mylongevitykitchen. This vinegary herb based sauce is so versatile already. But this recipe makes it more versatile than ever! 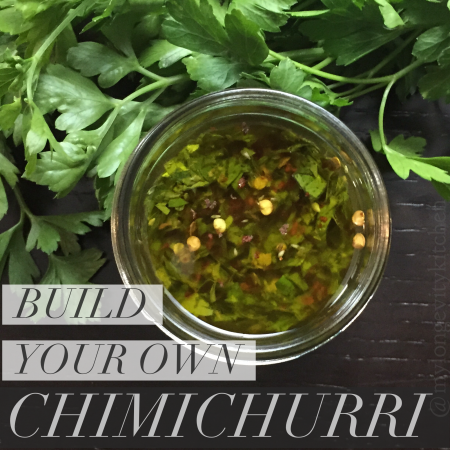 Build-your-own Argentinian-style chimichurri based on what you have on hand! Chop it up the old fashioned way, or blend it in the food processor to save time. You pick the ingredients, and you pick the method! Mince all of the garlic, fresh herbs, and any onions or peppers. To take the edge off the garlic (and onion if using), mix all base ingredients except for the parsley/cilantro and olive oil, PLUS now you will add your “optional add-ins”. Let this mixture soak for 30 minutes room temp or longer in the fridge (overnight is fine). You may also add the herbs now, which is more traditional, but the bright green herbs will turn a dull color. To save time you can skip this step and add everything at once. Add the herbs and 3/4 cup of olive oil. Taste and decide if the vinegar is too strong for your taste. 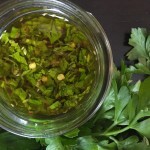 You can add up to 2 more tablespoons of water (when you use mostly parsley, you will want to add more water; cilantro can stand up to the vinegar much better). Taste for salt, and Enjoy! Keep this in a jar in the fridge for weeks. See notes for more ideas. If using food processor, still roughly chop the garlic, onion and fresh pepper to assist in proper mixing. To take the edge off the garlic, mix all of the base ingredients EXCEPT the fresh herbs and olive oil, PLUS the “optional add-ons”. Let this mixture rest for 30 minutes at room temp, or longer in the fridge (overnight is fine). To save time you can skip the step of resting 30 minutes. Add the fresh herbs to the food processor and pulse just a few times. Now add everything else to the food processor and turn it on for literally a second, just to mix. For a creamier sauce you can add everything EXCEPT the olive oil, and pour it into the machine while it is running. This will thicken the sauce a bit, and really blend it smooth. Taste if you like the strong vinegar flavor, or add up to two tablespoons of water (using parsley calls for more water, but cilantro can stand up to the vinegar better). Taste for salt, and enjoy! My Favorite version is mostly cilantro, some parlsey, and some fresh oregano. I mix red wine vinegar and lime juice, and blend in the food processor. The flavor is insane! You can even freeze chimichurri in ice cube trays. Once they are frozen, transfer to a freezer bag, and then use them to add flavor to dinner whenever you want!